A team of Gonzaga students, now alumni, developed the new dining app WildRide. As Ellie Woodle and five friends' Uber arrives, there's excitement among the group. Their destination: unknown. Their evening: an adventure. It's all part of the experience with WildRide, a locally developed app that launched earlier this month. The free iOS and Android app takes the occasional stress out of choosing a spot to visit. Users choose from either a restaurant, bar or both and enter their party's size and select a price range. With options to take an Uber or receive turn-by-turn directions to drive yourself, your group is off to a mystery destination. The app sent Woodle and her friends to Bellwether Brewing Co. in North Spokane. "I had never heard of it before, and that was really exciting because I got to go somewhere new," says Woodle. WildRide was the creation of five Gonzaga University students for an entrepreneurial class project. The students came up with the idea during a class activity for which they had to create a business concept based off two random words. From "Uber" and "roulette," WildRide was born. Soon the team realized their idea could be a business. "The problem is you can never decide on where you wanna go," says Hope Morgan, WildRide's CEO. "So this kind of takes the decision-making process out of it because we make the decision for you. It's an adventure." The app only picks from locally owned venues that have at least a four-star rating on Yelp, so no Applebees or Red Robin for you. So far the app's database has 50 restaurants and bars within the greater Spokane area. All locations were hand-picked by the team. None of those restaurants are currently being charged to be part of the service, but once WildRide builds up its user base in coming months, the plan is to charge restaurants that opt to remain in the app at a rate of $1 per customer who's actually been sent there via the service. Restaurant owners have the option to be notified via text message when someone using WildRide is being sent their way. The text lists how many people are coming and their estimated time of arrival. Businesses also will have the option to turn WildRide off if they're busy and don't want the app to send more customers to them at the moment. Currently, the app can't make reservations for a group on its way, but Morgan says WildRide is working with OpenTable to integrate that platform's reservation service into the app. 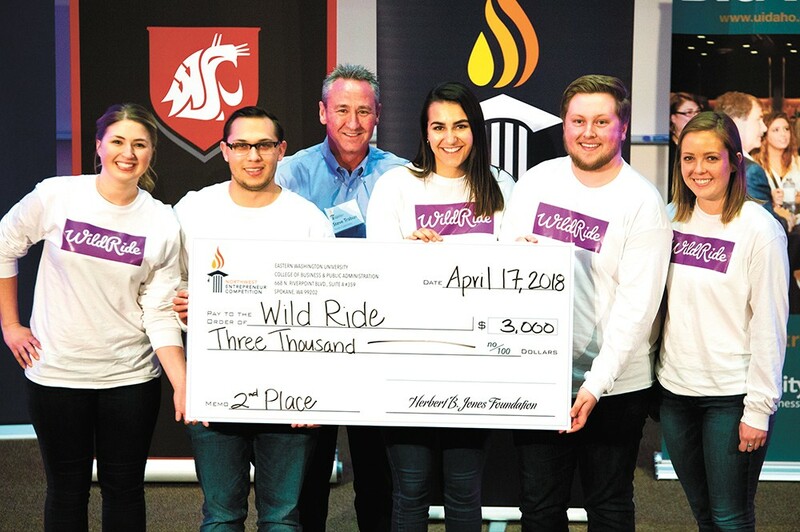 The group refined the idea for WildRide during a startup accelerator class taught by Tim Krauss, an adjunct professor in entrepreneurship at Gonzaga University. Krauss is the founder of App to Market, a business that helps turn people's ideas for apps into fully functioning products, like WildRide. The five-student team behind the app each contributed $10,000 out of pocket to the business, and so far have spent about $16,000 on app development. The team entered the business in this year's Northwest Entrepreneur Competition along with more than 60 teams from universities and high schools across the Northwest. The WildRide team won second place in the technology category, which came with a $3,000 cash prize. So far, more than 425 people have downloaded WildRide. The group's plan next is to ramp up their local user base and expand to cities like Seattle before they begin partnering with restaurants in order to generate revenue. "We make it an experience," says Stephanie Forsyth, WildRide's chief marketing officer. "It's something you just can't get through Yelp or Google or anything like that. It's a mystery." The original print version of this article was headlined "Dining Roulette"